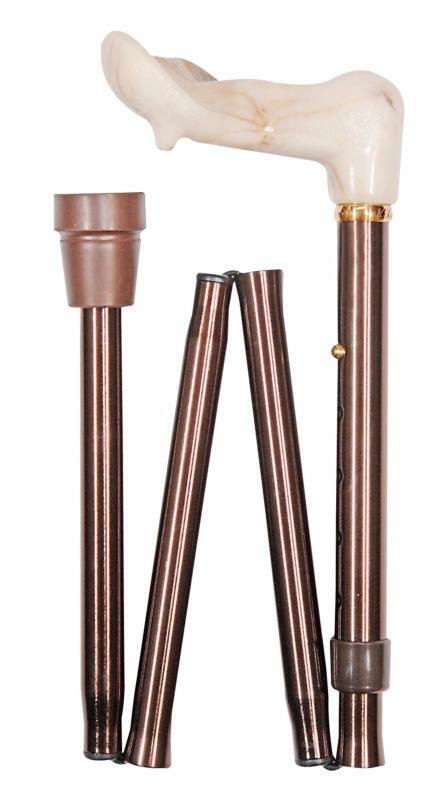 A handsome folding cane in coffee brown with a cream and brown marbled orthopaedic handle. The handle shape is often preferred by rheumatism and arthritis sufferers who experience difficulty in grasping a standard walking stick handle. The handle comfortably fits almost all shapes and sizes of hand. The shaft is height adjustable between 85-95cm (33.5"-37.5") and is fitted with a heavy-duty non-slip rubber ferrule. Ferrule diameter 19mm. Overall length when folded is 32cm approx (13"). Available to fit the left (ref. 4080L) or right hand (ref. 4080R).